After reading five fiction books in a row I felt like a change of pace, but I was still looking to have my mind stretched. With all the publicity that Lawrence K. Krauss has been receiving for his latest non-fiction offering, A Universe From Nothing, and having enjoyed his previous pop science book on the physics of Star Trek, I decided to give this one a shot. Pretty much the only things I knew going in were that 1) Krauss is enormously respected in the physics/science community and in the media at large, for his contributions to cosmology as well as for his role as an expositor of science 2) this new book was an instant bestseller 3) it promised to reveal the scientific plausibility of our observable Universe arising from, well, nothing, just as the title states. After reading the Introduction and watching a couple of interviews and lectures by Krauss it was easy to explain 1) and 2). As far as 3) was concerned, the book did indeed provide some detailed analysis (and speculation) about this notion, within the context of plausibility rather than proof or compelling evidence, as expected. The prose. Despite overwhelming reviews to the contrary by readers and reviewer's alike, I found the book to be poorly written. Krauss' sentences are often unnecessarily long and convoluted. They could use shortening, as well as fewer subordinate clauses. What's worse, he repeats the same exact word choices over and over (sometimes even in the same sentence!). In addition, the transitions from one paragraph to another weren't as clear as they could have been. Where was the editor? This may sound harsh, like I'm judging the prose of a science book by the aesthetic standards of a literary novel--after all, why should I mind a little redundancy or stylistic clumsiness? I want to be clear that this is not the case. 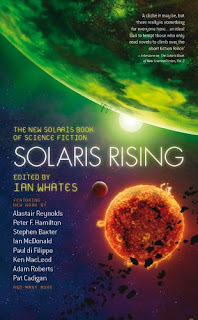 Krauss' style is not only mildly inelegant, it's poor, specially when compared to pop science books by writers like Carl Sagan, Brian Greene, Isaac Asimov, Stephen Jay Gould, Martin Gardner, Paul Davies, John Gribbin, Simon Singh, Jane Goodall, or Ann Druyan, just to name a few off the top of my head. And no, I'm not complaining about a scattering of inept sentences surrounded by otherwise smooth and poetic writing. The problem is widespread. Pick a page at random and judge for yourself. Listening to the book, as read by Krauss, only brought these problems to the fore. Too many sarcastic asides celebrating the virtues of secularism, the scientific method and the wonders of atheism (and yes, this is coming from an non-deist who operates as an atheist and adores the scientific method). We get it. With ringing endorsements by Dawkins, McEwan, and Hitchens, this isn't a surprise. But the pettiness of Krauss' remarks--at times emphatic to the point of heavy-handedness--, which I suppose are an attempt at levity, came across as smarmy, self-congratulatory, and just plain distracting. It's a pity that the book was marred in this fashion, since it truly does offer incredibly stimulating ideas. 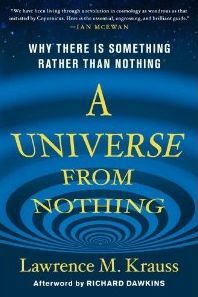 In one of the book's best chapters, for instance, Krauss discusses in magnificent detail the counter-intuitive difficulties (impossibilities, perhaps) that observers a trillion years hence will face in determining that they live in a Universe that is expanding, let alone expanding at an accelerating rate. For a first-rate fictional treatment of this same notion, I encourage the Curious Reader to seek out Alastair Reynold's mind-blowing "For the Ages," which can be found in the original fiction anthology The New Solaris Book of Science Fiction.